Despite the intolerable costs of climate change and inevitably declining oil, natural gas and uranium reserves, the vast majority of cities and urban communities are planned and managed as if such existential crises did not exist. Hence the transition from fossil fuel dominated cities to an urban future marked by a radically new, renewable energy infrastructure requires entirely new tools and frames of decision-making. Cities as settings of hope. Chapter 1 In the hothouse, beyond the peak: the logic of the urban energy revolution. 1.1 Energy and urban sustainability in the 21st century. Modern cities thrive on petroleum. Kyoto: neither far enough nor fast enough. Fossil and nuclear industries: fighting to maintain their grip. The global urban explosion: the end? Cities are seeds of change. 1.2 Fossil and nuclear energy systems and the industrial construction of reality. Expiring oil, natural gas and uranium supplies. Age of the fossil fuel city. The rise of the suburb. Fossil and renewable forms of globalisation. 1.3 Summary and outlook: for urban evolution there is no alternative to renewable energy. Three axioms of urban change. The urban energy transformation: both possible and necessary. 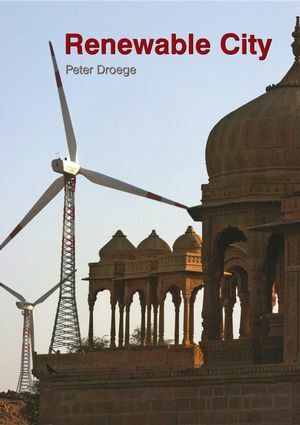 The global context: rise of the renewable energy economy. Chapter 2 How to cope with Peak Oil by preparing for climate change. 2.1 Confronting the risks to cities. The long race to the brink. Beyond the brink: beyond adaptation. Mounting prospects of discontinuous urban change. Gauging and managing urban risks. 2.4 Urban exposure and impacts. Anticipating impacts: physical, social and economic. The means of adaptation: planning for change. 3.1 Other drivers of change. A rich source of new employment. Community ownership of power; control over real and virtual utilities. Accountability: user sees, user pays, user gains. Regional regeneration and revalorisation impulses in the global urban regime. 3.2 The design of the Renewable City. 3.3 Renewable City form and formation. From plain old grid to intelligent energy web. 3.4 Space, time and energy: storing and dispatching renewable power. 3.5 Renewable citizenship: support communities and programmes. Long-range needs and short-term horizons. Climate stabilisation and city programmes: local efforts. Chapter 4 Building the Renewable City: tools, trades, technology. Fossil mobility and the urban energy crisis. Motors, movement and renewable fuels. Transport planning and policy imperatives. The end of the techno-fix. Heat island relief: the ancient wisdom of renewable city design. Trees, parks, urban wilds and agriculture. Water in the renewable city. Designing buildings with daylight in mind. Urban heat pumps: city power from the ground, water and air. Renewable rights and development control. 4.3 The Renewable City toolbox. Citywide renewable energy mapping (C-REM). Solar roof programmes, and other dos and don’ts in national efforts. Urban sun collectors: city-integrated solar-thermal technology. Regional renewable power systems (RRPS): from intra- to extra-urban generation. Bio-energy farms and forests: biomass, biofuel, biogas. 4.4 Urban renewable power finance. Financial benefits of distributed energy: direct renewable power and cogeneration. Chapter 5 Renewable City buildings: guidance and learning. 5.1 Renewable city building tools: rating performance. Built integration: the emergence of renewable building practice. 5.2 Learning from renewable building practice. The state of standards, regulations, and rating systems. Technical, media and general support. Chapter 6 Renewable City planning and action: guides for local government. 6.1 The Solar City programme. 5 Task A: Solar City strategies: renewable-energy based city planning. 6 Subtask B: Targets, baseline studies and scenarios. 7 Task C: urban renewable energy systems, business and industry development. 6.2 The Renewable City™ rating framework.